Any two accomplished musicians, given enough rehearsal time, can produce a competent performance. 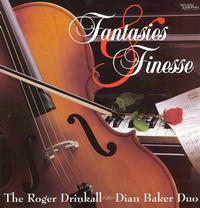 Roger Drinkall and Dian Baker, however, go far beyond the merely competent, rising to a higher plane where technical mastery and a perfect melding of mind and spirit make each performance pure magic. In the eight years since they formed the Drinkall-Baker Duo, the two musicians have taken that magic to more than six hundred concerts all over the world, garnering critical acclaim and a growing international reputation. The pair's approach is unique. They do not regard themselves as soloist and accompanist, but rather as two soloists, a true partnership of two equals. This philosophy brings to their playing a striking unity of thought and execution.